These guys are true pioneers. Not only did they release one of the first albums to be considered a death metal release (more on that later), but they were incorporating famous movies into their "gimmick," long before all those bands with names like "Nazgul" and "Amon Amarth" started popping up. Yes, DVC is indeed an acronym that translates to "Darth Vader's Church," and if he did go to church and they were playing music like the songs found on "Descendant Upheaval," I might actually be inclined to visit the holy grounds. "Descendant Upheaval" is considered to be a death metal album, but why? Where are the evil sounding death metal tremolo passages? Where are the blast beats? Sure, the vocals sound like they could be fronting a death metal band, but they also sound like they could be commanding some random grindcore act, basically resembling a cross between Oscar Garcia (Terrorizer) and Karl Willetts (Bolt Thrower). This album definitely treads along the same waters that Bolt Thrower's "In Battle There Is No Law" did, taking heavy influence from the thrash bands of the 80's and throwing in some punk. Instead of placing emphasis on heaviness and capturing an evil sound, DVC just onslaughts you with catchy riffs that will get your headbanging. The opening riffs in "Embalmed In Stone" are absolutely brilliant and wouldn't sound out of place whatsoever on an album like "World Downfall." Another instance where the "Grindcore" sound is clear is the inclusion of the bass. The bass sound can be heard pretty easily and it gets plenty of opportunities to shine on its own ("Southside Dirthead" and "Licentious Abandon") and get your head bobbing along. The drums are pretty fast, but the need to add blast beats never occurs with DVC and the need isn't necessary either. Another thing to mention is that the drums always have some kind of cool little fill or added nuance to the music which is always a positive. So, is "Descendant Upheaval" a pure death metal album? No, not in this writer's opinion. 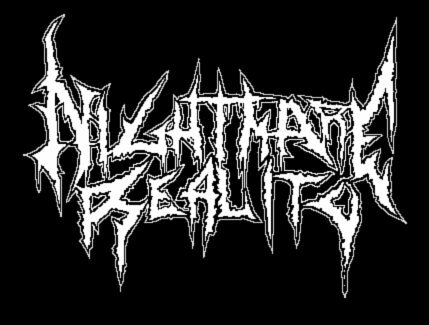 There are certain instances where death metal trademarks can be found, but it almost seemed like something foreign to the band. 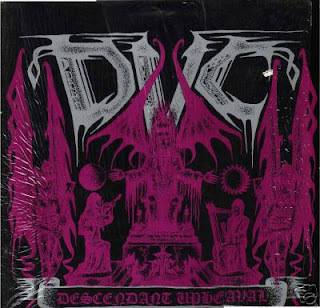 The attempts to incorporate a slower or doomy sound on the intro to "Eve Angel" don't sound as awesome as they do with other bands at the time (Autopsy and Obituary in particular) and the intro to "Bow of Mortis" is nice, but not nearly convincing enough to declare DVC's debut full-length a death metal album. This isn't the greatest metal album that you haven't heard of, but it's definitely worth checking out, especially if you're a fan of grindcore or early primitive death metal. On a closing note, make sure you don't skip the intro track "Cranium Overture," unless of course you are a freak and don't like Star Wars.